PSALMS 9:9 KJV "The LORD also will be a refuge for the oppressed, a refuge in times of trouble." 6O thou enemy, destructions are come to a perpetual end: and thou hast destroyed cities; their memorial is perished with them. 7But the LORD shall endure for ever: he hath prepared his throne for judgment. 8And he shall judge the world in righteousness, he shall minister judgment to the people in uprightness. 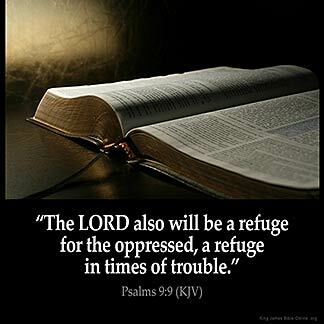 9The LORD also will be a refuge for the oppressed, a refuge in times of trouble. 10And they that know thy name will put their trust in thee: for thou, LORD, hast not forsaken them that seek thee. 11Sing praises to the LORD, which dwelleth in Zion: declare among the people his doings. 12When he maketh inquisition for blood, he remembereth them: he forgetteth not the cry of the humble. The Lord also will bee a refuge for the oppressed: a refuge, in times of trouble. The Lord is my refuge when I am oppressed : He is my deliver in times of trouble. And the Lord shall deliver me out of all my troubles. I can depend on Him. He will lift me out of the miry pit. Yes Amen !! Praise God !!! This means that when I 'm troubled or in pain my God is my helper. I must trust and relay on him all times no matter the situation.